Is Synaptics About to Make a Comeback? The chipmaker could finally hit gold. The global slowdown in smartphone demand and tough competition in the chip industry have knocked the wind out of Synaptics (NASDAQ:SYNA) this year. 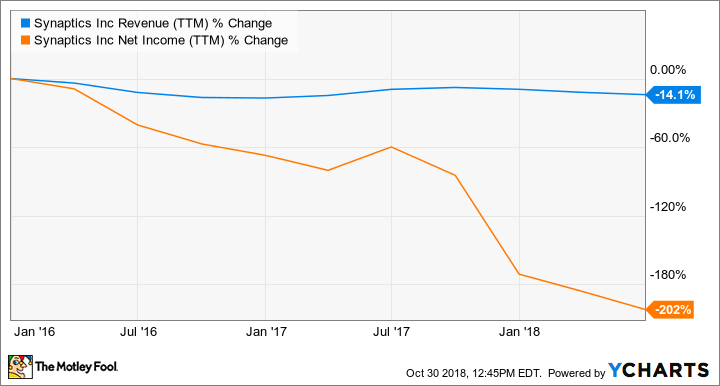 The company has taken a big hit, with its top and bottom lines dropping over the past couple of years, as you can see in the chart below. The stock is down about 6% so far this year. SYNA Revenue (TTM) data by YCharts. However, Synaptics is pulling the right strings to take advantage of several secular growth opportunities. The human-interface solutions specialist has gained impressive traction across lucrative Internet of Things (IoT) niches such as smart homes and connected cars. And there's a possibility that its mobile business could get back on track, thanks to recent design wins. Let's take a look at the key catalysts that could help Synaptics stage a comeback. The company next reports earnings on Nov. 8. The slow uptake of Synaptics' new smartphone technologies, and the decision by key customers such as Apple to move to facial recognition from fingerprint scanning, have weighed on the company's mobile business. What's more, the chipmaker seems to have lost ground at other key accounts such as Samsung. One way Synaptics can overcome this adversity in the mobile business is by tapping Chinese smartphone suppliers. The good news: It's making solid progress on this front. The company's display-driver technology and touch controllers are now being used by Huawei in its flagship Mate 20 Pro smartphone. This is a big win for Synaptics, as Huawei is now a major smartphone player. The Chinese smartphone giant moved 54 million smartphones during the second quarter of 2018, overtaking Apple's 41.3 million shipments thanks to a 41% annual jump in sales. It now occupies second place in the smartphone industry with 15.8% market share. More importantly, Synaptics claims that there are 20 smartphone projects in mass production that utilize its display-driver technology. That doesn't seem surprising as Synaptics' chip-on-film display-driver packaging enables smartphone OEMs (original equipment manufacturers) to make bezel-less devices with end-to-end displays, the latest trend in the smartphone industry. Given these factors, Synaptics investors can expect an improvement in the company's mobile business when it releases its first-quarter results on Nov. 8. However, there's more to the company than just mobile. Consumer IoT is gradually becoming a crucial part of Synaptics' top line, accounting for nearly a quarter of the total revenue mix. Synaptics has scored a bunch of important design wins in the IoT space over the past year, bringing on board the likes of Amazon, NTT Docomo, Harman International Industries, and Baidu. These tech names are using the company's far-field voice digital signal processors to create smart speakers. What's more, the company is now branching out into set-top boxes and smart televisions. Chinese electronics firm TCL's televisions with in-built Alexa capability are powered by Synaptics' far-field voice technology. Meanwhile, Synaptics is bringing similar functionality to both legacy and new set-top boxes, allowing users to control their TVs with their voices. As such, Synaptics is going after two big-volume markets that could significantly boost demand for its audio chips. But the chipmaker won't be limiting its scope to just these two IoT-specific markets. The market for in-car infotainment is another big opportunity for Synaptics, as touch screens are now an integral part of a vehicle. The company recently announced that it is now shipping its new family of automotive touchscreen chips, which have already been selected by leading manufacturers for deployment in upcoming vehicles. Synaptics claims that its automotive chips will deliver "superior optical performance over conventional touchscreens" while keeping production costs down. So it wouldn't be surprising to see the company making a dent in the in-car infotainment market, which is expected to clock an annual growth rate of 13% over the next five years. Synaptics investors shouldn't be surprised if the chipmaker stuns Wall Street with a set of solid results this week. That, along with a nice outlook, should be enough to turn Synaptics' fortunes around, and help it make a comeback sooner rather than later.